History of Dallastown | When was Dallastwon PA Founded? Just 20 minutes southeast of York, you’ll find the charming borough of Dallastown. The community has a population of nearly 4,000, giving it a cozy, small-town feel while still within an easy 20-minute drive of York’s amenities. If you’re not familiar with Dallastown, we’ve put together this small guide to the region’s rich history. 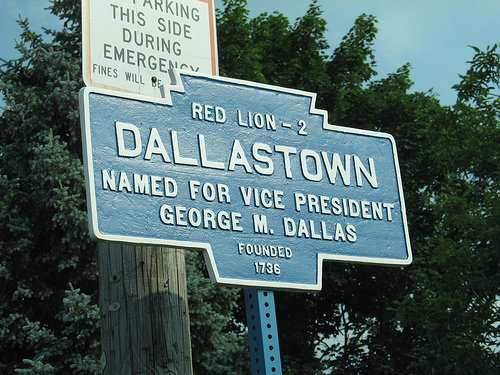 Dallastown was officially incorporated as a borough in April 1866, but it traces its roots back over a century earlier. According to its entrance marker along Route 74, the first Europeans settled on the land now located in the Dallastown border in 1736. The town then grew along highway, trolley and railroad systems. The first Dallastown settlers were mainly basketweavers. They toiled by hand and sold bushel baskets to area farmers, but the introduction of basket-weaving machinery rendered their hand-crafted services unnecessary. Cigarmaking took over as the top regional occupation, and Dallastown quickly became a national leader in hand-rolled cigars during the height of their popularity. In 1884 alone, regional workers rolled around 25 million cigars. The borough was named in honor of George M. Dallas, of Pennsylvania. Dallas served as the mayor of Philadelphia and as a U.S. senator before becoming the 11th vice president of the U.S. under the James K. Polk administration. Citizens named the borough during Polk’s 1844 presidential campaign. Dallastown is known for Lyndon B. Johnson’s visit in 1966. Johnson and his wife Lady Bird visited the town during his presidency to keynote the celebration of its 100th anniversary. Congressman Neiman Craley, of York County, was credited for bringing the anniversary to the president’s attention. The town was the birthplace of Hollywood actor Cameron Mitchell in 1918. While not a railroad town, a spur of the Ma & Pa Railroad reached into Dallastown and was used by cigarmakers to sell their products. Residents also rode the train to nearby Springwood Park to enjoy the Springwood Pool. Commercial Hotel: The old Commercial Hotel is one of the most architecturally prominent buildings in Dallastown and marks the borough’s traditional center along Route 74. It sits at the corner of Walnut and Main streets and is now used as an apartment complex. Windridge Farm: Formerly the Hoover farm on South Pleasant Avenue, Windridge Farm has been transformed into an eatery and brewery. Historical Society: The Dallastown Area Historical Society, located on East Main Street, brings history to life. During the first Sunday of every month, you can view historical artifacts connecting you to Dallastown’s past. Are you interested in life in Dallastown? At CENTURY 21 Core Partners, we provide expertise in buying and selling homes throughout York County. Contact us today to learn more about finding your perfect Dallastown home.